Next season Red Bull will race Honda power, joining junior team Toro Rosso on the Japanese manufacturer’s customer list. That will bring end to Red Bull’s long-term relationship with Renault, which has soured since they last won the championship back in 2013. Although Max Verstappen finished Sunday’s Belgian Grand Prix in third place, the Dutchman was 31s behind race winner Sebastian Vettel prompting Horner to speak about how much Red Bull need to switch to Honda power. “Yeah, I mean we need to make a step,” he told Sky Sports. “You can see the gap to Ferrari and Mercedes… you just heard Lewis [Hamilton] moaning about Ferrari, I nearly got my violin out. “You know, the gap is significant and I think if we can just close that. Horner was nonetheless happy with Verstappen’s performance on Sunday as he raced from seventh on the grid to third at the chequered flag. “Awesome drive by Max,” he said. He keeps his nose clean at the start, as it was all happening to the left of him and then he had to pass the Haas and as you can see, he is having to do it all on the brakes. “They [Force India] were very, very quick [in a straight line], and you can see from our rear wing, the angle that we are running. It is all about trying to help the straight line speed, which hurts us through the middle sector so he is having to drive the wheels of the thing in the middle sector. He was managing to match the pace, particularly in the second half of the race, of the lead two drivers. 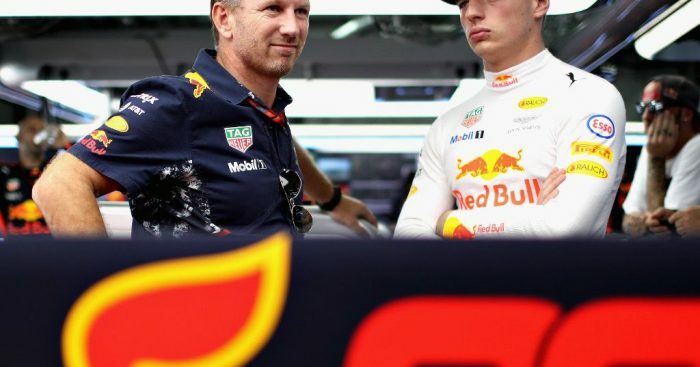 Looking ahead to next weekend’s race, the Italian GP, Horner revealed that while Daniel Ricciardo will have an engine penalty, Verstappen will remain penalty-free as he takes his third engine for this season. “It will be a case of trying to get ourselves on the best footing. Daniel is going to be taking an engine penalty next weekend for sure, Max will be taking his third unit there, hopefully without penalty.